This blog is about how and why toxic people play foul games with the lives of other people with whom they are somehow related, mostly for power and influence over them and the consequences are damage, disease and death. I emphasis here too, these foul games cannot be played without medical misinformation. And remember heart disease affects one third of most societies, particularly in the West. When people know the truth however, they have the ability to control over how they react and that is the difference between disease or no disease, between life and pre-mature death! Note2: The previous posts on emotion, ESP and comfort zones are necessary to understand all of the following posts. Heart disease is all about maltreatment, it is not a disease in the sense of something that results from “natural causes” as the doctors proclaim. It is not a disease of old age. It is only that older people are highly vulnerable, most particularly those in old age homes. We now see school children suffering fatal cardiac arrests in the school playground! Toxic adults and toxic parents train their toxic children in the ways and methods used in foul play; first targeting animals, especially other people’s pets, then other children and seniors in society. One of the supposed causes of heart disease it is claimed is genetic predisposition. This assumption is based on familial trends. However if you look back beyond the grandparents generation the heart disease in most cases vanishes. And this is particularly true of women. In the 1950’s and 1960’s heart disease was near unknown in women. It was considered a man’s disease. 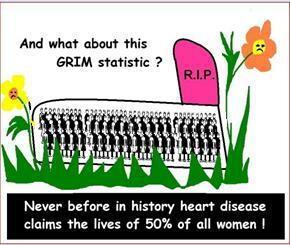 Today, some fifty years later, heart disease is the number one killer of all women! Heart disease is part of the new forms of domestic violence. When a woman is maltreated by her husband (or vice versa) for the sake of gaining power and influence over her, there are two consequences that flow on from that maltreatment. Firstly her health and thus her ability to parent are both diminished. Her children become victims. Secondly the maltreatment of a spouse necessarily means that the family is surrounded by criminals. And they are not obvious. They will include people who infiltrate and become “a part of the family” and hence highly influential, especially when they appear benign. And these people have an agenda. That agenda is firstly to recruit children, those that are “ripe for the picking” and train them in the ways of being evil, which is to say in the ways of doing harm to other people. Thus the children of such a family will either develop toxicity and/or become the prey of toxic people, including their toxic siblings, indeed primarily by their toxic siblings and not only in childhood but for a lifetime. And note that those that become toxic are also victimized by other toxic people. So the chances that they will also develop heart disease are enormous. And note that all of these toxic people, from the GCIs (gun carrying individuals) to the friends that become part of family life, won’t necessarily all know each other and they can honestly say they don’t know one another, but that is owing to the ways in which toxic people operate. However they are part of the same foul game and have the same agenda. The other part of the agenda is the acquisition of victims, which are commonly drawn from those that they can’t recruit but those recruited are also most often victimized as well. Victims are desired as I explained in an earlier chapter, partly to add to their list of people they harm for the pleasure it brings them, and partly for the training of their own and other toxic children. And let me say this training is neither “meek and mild” nor any hit or miss event. They aggressively put their toxic children through a relentless training program, targeting anyone and everyone who is “available”. And not surprisingly they keep the victims, in the dark as to what is going on. This is also a part of the training of toxic children because not only does it give them practice at being stealthy, it also trains them to be deceitful. If they can deceive their own siblings, whom they must face every day of their lives, and get away with it, then they can deceive anyone and everyone else. So the non-toxic parent –typically a mother but not only, since a growing number of men are equally maltreated by toxic wives- encounters problems that are surely visited on her children and grandchildren etc. And we can certainly find genes to point to because all modifications that are made in the body have consequences and most probably also changes in genetic expression and such changes may possibly be passed on. That needs to be researched but there is sufficient evidence when we see the existence of what are known as oncogenes in families where the particular type of foul play consistently brings cancer into being in the unsuspecting victims, generation after generation. And as can also be seen the existence of oncogenes does not mean the person develops cancer. Without the foul play there is no cancer, oncogenes or no oncogenes! And the same is true for heart disease. Furthermore once we understand what heart disease entails we can get well and help others to get well, irrespective of the genes we or they may carry. And they get well because with knowledge they are able to employ a two pronged defensive strategy. Firstly they can fight back and ward off the offenders, and again here none of it is done in the physical plane. The war is waged by the offenders and won by the people targeted in the mental realm, utilizing ideas! Secondly the person targeted or victimized can use autosuggestion in the form of mental prescriptions to help their body either minimize or even eliminate the stress and, if not then to suffer little harm and to heal. So we, the humane lay people, can show by our own experimentation when we become organized, that “genes or no genes” without the maltreatment there is no heart disease. The medical profession has sound monetary interests in propagating what is really the myth of disease, especially when it comes to the aged because doctors expect to gain a large slice of their cash flow from them. We have reached a disgraceful state in our societies where everyone can expect to die an agonizing death and possibly hospitalization or “nursing home care” unto death. And the cash flow for the doctors most often comes straight out of the public purse –money guaranteed. When you consider the diseases of people in old age homes you will begin to appreciate that they are nothing more than slaughter houses. It is little wonder that many people are considering euthanasia rather than enter an old age home. Heart disease has everything to do with the malfunction and damage of the heart owing to ongoing maltreatment. When the maltreatment, in which ever way, stops the body begins a clean-up and repair operation and is capable of restoring full health. And I would venture to say that even in those poor souls who are awaiting heart transplants, their body would respond once maltreatment is ended and would heal. Here again I want to show you how a person can do plenty to circumvent the circumstances and restore their health even out of dire circumstances or not suffer any disease in the first place, but for all that knowledge is vital. Why is diagnosis, especially in women and young people, missed? A woman may go to the doctor complaining of chest pains and other heart related symptoms but when her heart is examined nothing is found. Her heart tests show a perfectly healthy heart. However she may then drop dead of a heart attack or suffer debilitating damage to her heart the very next day. And this is not only in women. I know of three cases of men been seen by their heart specialist, given a clean bill of health and all three died of cardiac arrest whilst driving home from the doctor’s visit! What’s going on? A perfectly healthy heart can be catastrophically damaged in a matter of hours, even less! There is a problem with medical tests that the doctors are reserved about and that also points to the fact that many diseases are not the result of natural causes by maltreatment. How reliable are medical tests? A medical test is like taking a single frame out of a movie. If, when you take the snapshot, the movie is showing action, then the frame you will have captured depicts that action. If however at the time you take the snapshot nothing much is happening then the frame you will have captures says nothing; So too with medical tests. If the tests are done when the person has regained their peace, which means their body is at rest, then the tests will show nothing. If the tests are done when the person is stressed, then depending on the level of stress the tests may show something. However only after the stress and malfunction of the heart here in particular has led to damage, either in the way the heart functions or its structures, will the test show something significant. This means that medical tests are unreliable as they stand today to be used as a preventative measure or indicator of any sort. Then we have another problem and that has to do with the way doctors interpret the data. I have seen doctors on television make the following (I assume) error or at least one would hope it is only an error and not deliberate! In assessing a person’s health, they commonly quote the blood pressure without making any reference to the heart rate. Say for instance they may say “oh yes 110/60 is a good, i.e., low blood pressure!” Is it? Assessing blood pressure without reference to the heart rate is meaningless! Let me explain why. The heart is essentially two pumps that must work harmoniously together. 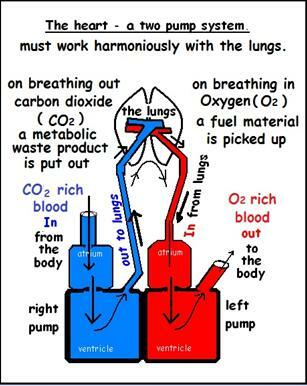 One of these pumps, pumps the carbon dioxide rich blood that it has received from the body to the lungs. The other pump, pumps the oxygen rich blood that has returned from the lungs back into the body again. And these pumping actions are done with synchronous electrical stimulus but also with intimate interaction with another organ, namely the lungs so these pumps must be synchronized in order to do the job properly. And the heart and lungs must also be in tune with one another as they are essentially two part of one system. Any changes in one of these organs, affects the other. These pumps do not simply “pump or not pump”. They have a range of pumping capacities. Just like a dimmer switch that can be turned on more and more to get more and more light so too these pumps can go faster and faster in a gradation of activity. If we consider first the light switches we need to move the switch to the appropriate setting in order to get the amount of light we want. In the heart we have a similar system. If we want to sleep the heart rate must slow down. If we are doing normal waking state activities we have the normal base rate of 60 to 70 beats per minute in a healthy person. If we begin to exercise the heart rate will increase accordingly but so too if we become angry or fearful! The heart rate is a measure of how hard the heart is pumping blood. If it is working hard then it should be pushing the blood more quickly through the body’s vessels. This means that the blood pressure goes up. If the heart is slowed down as in sleep then the blood pressure goes down. The blood pressure is an indicator of how well the heart is pumping blood throughout the body –in a healthy system. So if the blood pressure is high and the heart rate is normal then something is wrong. We need to ask why is the blood pressure too high? We may find arteriosclerosis, a hardening of the arteries due to a buildup of plague that adds to the inner walls decreasing the area through which the blood passes. Asking this question with only the blood pressure is no good as it doesn’t tell us anything. The assumption that doctors seem to make is that if the person is inactive then the blood pressure should be at a certain rate that is consistent with their inactivity. However what do they call inactive? Inactive means they are not exercising or moving about. What if they are angry or fearful? Their body is active even though they are not moving about! A person who is angry or fearful exhibits a rapid heart rate and as a result a high blood pressure. 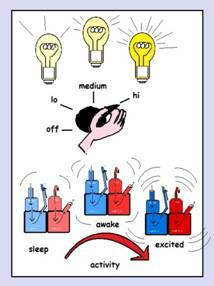 Even a person who is excited about something has a slightly elevated heart rate. So making the assumption that their body is inactive simply because they are not moving about is wrong. The problem is that physicians do not treat emotions as changes to whole body function. They are taught at medical school that emotions are experienced in the brain somehow and thus are not part of the physiological picture. This medical policy camouflages the true causes of diseases such as heart disease. It enables physicians to treat the physical symptoms, which are, after all only a person’s emotional response, as pathological. However when those symptoms “persist”, which happens when a person is troubled in an ongoing fashion, then the damage is done and that means it can be treated with a lifelong course of drugs and medical procedures. It appears to me to be all about business strategy and nothing else! If we take the heart rate and the blood pressure together then we see a complete and accurate picture. If we find a high blood pressure we don’t just jump to conclusions that it is symptomatic of disease and let them push drugs on us. And in making our assessment we need to go further and discover the issues that bring about our emotional responses. Are we angry or fearful for instance? Are we excited about someone or something? And who may be behind the issues? Is it a spouse or a seeming good friend or a work mate etc. All of this needs to be considered.. yes in correctly reading your blood pressure! By discovering and dealing with the real issue at hand – and such issues are always current issues and not some imaginary stuff from the past– can the changes that we experience in our bodies be brought back to harmony and balance. No drugs are needed in this case! A person who is being angered by a toxic mob and who is put on high blood pressure medication and taught anger management is still going to end up with heart problems. We can see one instance at least, where the heart beat will still be rapid. Some drugs for lowering the blood pressure make the arterial vessels artificially relax so the pressure is artificially brought down. This means the arteries have a larger diameter and thus carry more blood. It is not even a bandage fix. It is a camouflage until the heart problems emerge. Long term “managed” anger states, in body terms! While the blood pressure may be “managed” by loosening the arteries to their largest diameter, the heart will still be working a lot harder than it ought to work. There can be a lot of different problems emerge. For instance, the heart is effectively a muscle and when you exercise a muscle very hard it gets stronger and stronger but it also gets bigger and bigger. It also means that the person’s heart is working at a higher capacity than normal so if the person is suddenly made angrier or more particularly very fearful, their heart will attempt to accelerate from a maximal position. Both an enlarged heart and an overworked heart made to suddenly work harder can have devastating implication. It’s a bomb waiting to go off.. on medication! But of course the doctors are there to make money out of medical conditions that eventuate. It would be getting in the way of making profit to help the person really solve their problems so that the business didn’t come about. Low blood pressure is also seen by the same yardstick. It is generally considered a good sign and yet it may also be a dire warning. But here again the pressure reading in itself is not enough to know if it is good or bad. If the heart rate is normal for resting states, which means not exercising and no emotional charge, it will be beating at around 60 to 70 beats per minute. When we see this rate then a low blood pressure is a good sign. If however the heart rate is around 80 and higher then a low blood pressure is a bad sign. To explain this let me try to give you a comparable example. Supposing you go to a gas station to fill up your tank with petrol. The service attendant begins to fill your tank and you wait and you wait and you wait but the tank is barely filling. Then you notice that the attendant is playing with the pump switch, on and off, on and off, on and off. The petrol will gash for a moment and then drip then gash then drip. Without a decent flow of petrol you’ll be there all day waiting to get petrol for your car. The heart can become ineffective as a pump and low blood pressure is a sure sign if the heart rate is correspondingly high. Here again we need to understand the person’s emotional status. Is the person anxious? Anxiety is written off as a mental disorder and attributed to brain malfunction. That is certain to help keep up the drug sales up but it is a long way from the truth. Anxiety is an emotional mix that ought not to be enduring. And under normal living conditions it is not enduring, however as we saw earlier through foul means anxiety can be made enduring. Anxiety is made up of fear and worry (or anger and worry). And to recap fear means a high sympathetic nervous system tone, which sends signals to the heart to go fast. Worry on the other hand means a high parasympathetic nervous system tone, which sends signals to the heart to go slow. When the heart gets signals to go fast and slow at the same time it may exhibit an overall higher rate but its ability to pump blood efficiently is affected. This is no different to the service station attendant playing with the petrol pump switch and clicking it on and off all the time. If anxiety is the cause then the person needs to discover the issues and address them so that the anxiety is dissipated. With the anxiety gone the heart should return to normal healthy function, which means the heart rate will drop to normal and the blood pressure will rise to a normal rate. If the person can only partly resolve the situation then the worry may be dissipated so that even if the heart is running fast due to fear the blood pressure should also be high, or in other words the heart is able to work efficiently as a set of pumps. If there is no emotional disturbance then it is proper to investigate further to see what may be wrong with the cardiovascular system. We can also see high and low blood pressure with respect to the coping habits as well as the emotional reactivity. An EMCM will push the heart beat up higher and that means it will also make the blood pressure rise. A LMCM will tend to slow the heart and drop the blood pressure but this is of course moderated by the sort of emotional reactivity present as for instance with fear and anger a conflict situation arises, with worry alone an additive problem or slowing of the heart and blood pressure drops will occur. Just giving blood pressure medication either for high or low blood pressure without deciphering what is going on is highly irresponsible, even if it is highly profitable. The long and the short of it then is that the blood pressure should always be quoted alongside the heart rate and really also the breathing rate and breathing capacity too because the heart and the lungs are two part of one system and they do affect one another. For instance if the anxiety is the mix of anger and worry, and it is of sufficient intensity, then the breathing can be seriously affected, which will in turn affect the heart and make matters a lot worse. Anger raises the heart rate and worry seeks to lower it so there is this same problem here too but it is compounded by the breathing. Anger changes in the body are ignited through deeper more forceful breathing. Worry as we saw earlier seeks to make the breath more subtle in order to stop the brain from having to compete with the skeletal musculature for fuel materials. The breathing begins to oscillate between subtle and forceful breathing. This can have devastating effects on the heart as it will cause abrupt changes back and forth in heart function. Forceful breathing accelerates the heart while subtle breathing decelerates the heart so anger/worry anxiety is a particularly bad problem for the heart. At present the medical business treats anxiety as a mental disorder, they treat people with drugs for what are normal body functions under the circumstances. In effect doctors help to perpetuate the maltreatment until heart damage is sustained and then of course the money that can be milked from the victim for wires, pacemakers, transplants etc. Heart disease and heart attacks are more complicated foul play than panic and anxiety attacks. That added complication is the ways in which the person is “prepped” for a heart problem to emerge, when the same foul play as in panic and anxiety attacks occurs. So in the next post I will discuss the prepping of the victim. I will say here that heart disease is a very big subject and there are many different ways a person will react. And in a few blog posts I cannot do justice to the subject. However I will be able to draw the broad strokes, enough for people to understand what they are up against in the development of heart disease. But such knowledge can help them address the problems sufficiently as to reduce their risk of serious heart problems. This entry was posted in anger, anxiety, arteries, arteriosclerosis, blood, blood pressure, blood vessels, breath, children, comfort zone, coping mechanisms and breathing, disease, domestic violence, EMCM, emotional reactivity, emotions, ESP, family, fear, forceful breathing, foul play, GCI, gun-carrying individual, heart, heart disease, ideas, LMCM, maltreatment, medical tests, non-toxic parent, oncogenes, plaque, relational entanglement, relationships, subtle breathing, thoughts, toxic mob, toxic parent, toxic relationships, Uncategorized, veins, worry and tagged anger, arteries, arteriosclerosis, blood, blood vessels, breath, children, comfort zone, coping mechanisms, disease, domestic violence, EMCM, emotional reactivity, emotions, ESP, family, fear, forceful breathing, foul play, GCI, gun-carrying individual, heart, heart disease, ideas, LMCM, maltreatment, medical tests, mother, non-toxic parent, oncogenes, plaque, relational entanglement, relationships, subtle breathing, toxic parent, toxic relationships, veins, worry. Bookmark the permalink. 1 Response to Heart Disease: The games get more serious AND deadly.